Do you ever buy yarn for a project and then forget what project you bought it for? Or perhaps see a pattern you love at the yarn store but don’t remember what you have at home so you end up buying more yarn?! Yeah, me too!! 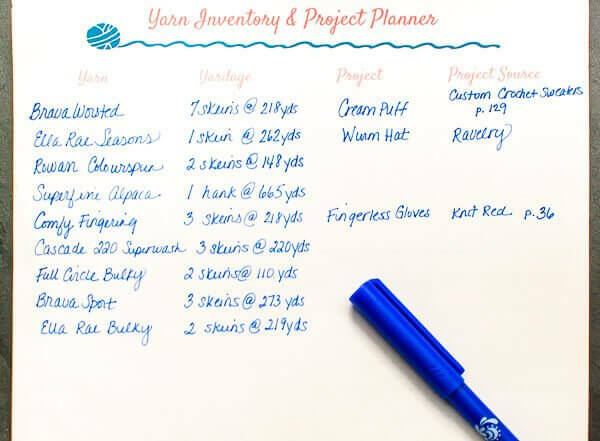 So I thought I would share this handy Yarn Inventory and Project Planner Printable I created to help keep my stash organized (… at least on paper!). So now whether I buy yarn with a specific project in mind or am just buying it because I love it, I make sure to log it here so I can quickly and easily see what I have or whether I have enough for when a new pattern calls to me. What about you? Do you have any tips for keeping your stash organized? I will be able to order more if needed. Thanks for the idea! I keep my planned project yarn in small bins. If the pattern came from the internet, I place the pattern in the bin with the yarn. If it came from a magazine, I write the name, date, and page number on a paper that goes in the bin. Odds and ends that will be scarves, hats, motifs, etc. go in a bigger bin. This is a good idea but I would lose that paper after a day. Love this idea!!!! I would also add a column for the color name of the yarn and/or a place to tape a tiny sample of the yarn. 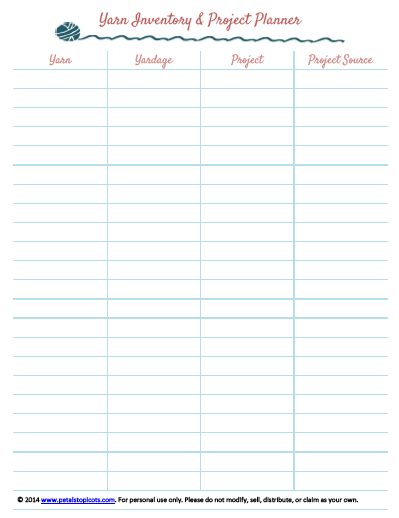 Printing–now hopefully it helps me get a little bit more organized!!!! I agree that it would be good to put on paper so I would print this off and stick it in my purse. Because I dont carry electronics when I go shopping. Still love pen and paper. What a great idea!! I have a TON of yarn and this would be a great way for me to see what I already have stashed away! Thank you for sharing your idea 🙂 I know there are lots of digital ways to keep track of what yarn you have, but I’m much more comfortable with paper and pen. I find Ravelry’s stash tools to be extremely useful, and with my smartphone I can check what I have and dont have at a moment’s notice. I would definitely lose a piece of paper!